Mikey Garcia was very impressed with Jorge Linares’ dominant performance against Anthony Crolla on Saturday. Nothing Garcia saw, however, made him change his mind about wanting to fight Linares next. 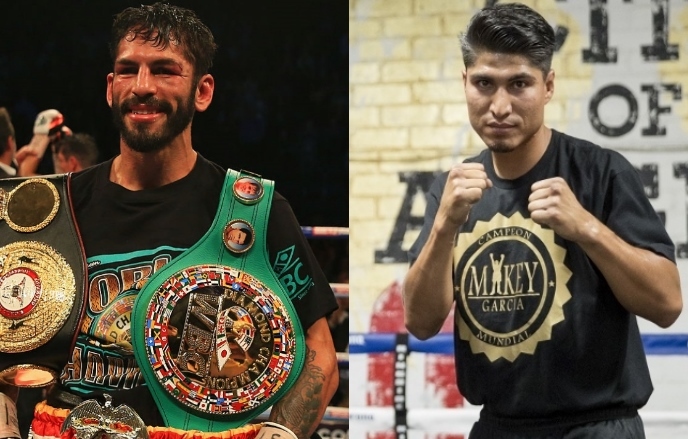 The unbeaten Garcia, the newly crowned WBC world lightweight champion, hopes to face Linares, the WBA world lightweight champion, in what would be an intriguing 135-pound title unification fight in the summer. “Congratulations to Jorge,” Garcia said during Showtime’s studio coverage of the Linares-Crolla rematch from Manchester, England. “He looked great. He obviously performed better than on the first night. This time he out-boxed Crolla a lot easier, showed skill, showed flexibility, moving around the ring, combinations, dropped him with that uppercut. A faster, sharper Linares (42-3, 27 KOs) easily out-boxed Crolla throughout their 12-round rematch, six months after overcoming Crolla by unanimous decision in a closer fight. Venezuela’s Linares dropped Manchester’s Crolla (31-6-3, 13 KOs) with a left uppercut in the seventh round, fended off Crolla’s rally in the eighth and ninth rounds and won by the identical large margin on all three scorecards (118-109) at Manchester Arena. Garcia, meanwhile, knocked out previously unbeaten Dejan Zlaticanin (22-1, 15 KOs) in the third round to win the WBC world lightweight championship January 28 at MGM Grand Garden Arena in Las Vegas. His impressive victory over Montenegro’s Zlaticanin was just the second fight for the 29-year-old Garcia (36-0, 30 KOs) since the Oxnard, California, native ended a 30-month layoff that mostly resulted from a contractual squabble with former promoter Top Rank Inc. The three-division champion just hopes Linares, also a champion in three weight classes, will get in the ring with him. Linares, Easter Jr, Lomanchenko In that order would be impressive. [QUOTE=PETUFF;17541611]i hope the coward don't get Linares thats too easy for him we know that we want Lomachenko! :boxing::boxing:[/QUOTE] Who gives a phuck what you want. PR boxing is dead, thanks to Mikey. Hahahahha. Mamame la pinga pedaso de mierda. Mikey is kryptonite to Jorge Linares. If Linares had a chin he might be a top 3 pound for pound fighter. As it is he is an accident waiting to happen.